We discuss the benefits of training and the advantages of focusing on positive reinforcement quite frequently, but I have long believed that training does far more than we realize. Positive reinforcement training expands animals’ repertoires, makes them better problem-solvers, increases their resilience to change and, dare I say it, boosts their intelligence. The evidence of these benefits is anecdotal, but I would suggest that the examples below present a compelling case for supporting these claims. A friend and colleague of mine, Ilana Bram, shared a story from a local co-op where she trains goats to do various husbandry behaviors. The co-op also has chickens living on site, and Ilana began training one hen in particular named Chickie. Chickie really took to the training and was an eager learner, developing a small but solid repertoire of behaviors. Sadly, a few weeks ago raccoons got into the enclosure and killed almost all of the chicken population. Only four birds survived the attack, and Chickie was one of them. Ilana asked if I thought Chickie's exposure to training contributed to her ability to escape the attack. She accurately pointed out that training had expanded Chickie's behavioral repertoire, which included climbing on objects, flying short distances, and exposure to new areas within the enclosure. 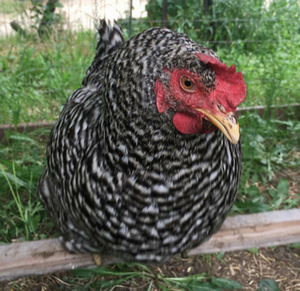 Ilana said that Chickie’s personality seemed to change after the training; she was more daring and exploratory, venturing further out than the other chickens, and boldly soliciting treats from people. Might these things have given her a survival advantage? I immediately responded, "Yes!" I have long believed that training gives animals new skills and makes them better problem-solvers. We will never know for sure whether those skills made a difference to Chickie on that terrible night, but I believe they did. This incident brought to mind other examples of well-trained animals showing resilience and accomplishing incredible things. I spent several years as the trainer for a group of more than 200 birds in a park in Mexico City. The population included several species of parrots, ravens, toucans, birds of prey, and a variety of songbirds. These birds lived in social groups in large free-flight aviaries. 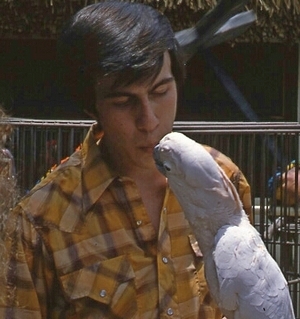 We did basic training with all the birds, but we focused most of our attention and advanced training on the birds that were part of our daily shows. The complexity of training varied from species to species, but included flying on cue, medical behaviors, tactile, vocalizations, and lots of socialization and desensitization to new people and places. Early one morning, Mexico City experienced a devastating earthquake that registered 8.0 on the Richter scale and created widespread damage in the area. When I arrived at the park, I found that although three of the aviaries were still standing, two of the aviaries had sustained serious damage. A large building next to the enclosures had collapsed, and huge slabs of concrete and shards of glass had torn holes in the aviary and crushed or buried sections of the birds' homes. As we inspected the area, what we found was heartbreaking. Most of the 62 birds who lived in the damaged aviaries had died, primarily from inhaling smoke and dust created by the collapsed building. Words cannot describe the pain we experienced over the wonderfully bright lives that were lost that morning. But something miraculous also happened; we discovered 17 birds that had somehow survived and made their way to safety. The birds were hanging out in three different places. They had found their way to the trainer's office, the flight training area, and the show stage. Of the 17 birds that lived, 14 were birds from our show. They included five macaws, three ravens, two Amazon parrots, two cockatoos, and two toucans. Only two birds from our show failed to escape the disaster. Given the variety of species involved, their escape from two different aviaries, the unusual routes and extraordinary effort to get to where we found them, and the large number of similar species living in the same space that did not survive, it seems more than a coincidence that it was primarily the well-trained birds that found their way to safety. All of the birds had spent time in the training locations and had access to those spaces; the only difference was that they had not had the same complex and extensive training. We could not find any other logical explanation. 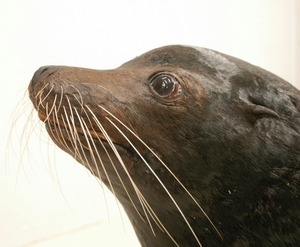 On a lighter note, I would like to share the story of a California sea lion named Jones that I worked with in Texas. We were doing some renovations to one of our sea lion habitats, so we relocated Jones and six other males to a temporary home located right next to a large lake. Jones was an older, well-trained, very experienced animal. The other six animals were rescued animals that we had recently adopted, and although they were part of our training program, they were still in the early stages of training. The sea lions had been living in their temporary habitat for about six weeks when we began to notice that Jones was starting his mornings very slowly. He was healthy and bright-eyed, but he behaved as though he had just eaten a huge meal. We knew this wasn't the case because his last meal had been the night before. Sea lions have voracious appetites, and Jones would still eat his morning meal, but he ate slowly and seemed full. The veterinarian found no signs of illness, and we were baffled. This unusual behavior had gone on for almost two weeks when in the wee hours of the morning I received a phone call from one of our night security officers. He claimed that he saw a large animal in the lake. I knew that the only animals living in the lake were fish, nothing large like our security guard was describing, so I went into the park to investigate. It was still dark at 4:00 am when I arrived to check out the mysterious report. In the moonlight, I could see a large body break the surface of the water, then quickly disappear below the surface. It took me several minutes to recognize the distinct form of a sea lion! But how was that possible? I dashed over to the sea lion habitats in alarm. When I arrived at the habitat next to the lake, I immediately noticed there were six instead of seven animals. Jones was missing. That must be him in the lake! I carefully inspected the habitat. No open doors; they were all locked. No holes, gaps or openings in the fence or wall. How did he get out? Had he really been fishing in the lake like this for the past two weeks? It didn't make sense. I decided not to call him over nor alert him to my presence. I found a comfortable spot to sit and observe out of sight. At 5:45 am, as the sun began to rise, Jones made his way out of the lake. He paused in the shallow beach water, and seemed to be looking around, as if to make sure nobody was looking (am I being anthropomorphic, or what!). Then he waddled over to his habitat, approached the shortest part of the fence, and stood up on his rear flippers. This is not a natural behavior, but one that I had taught him years before. He was barely able to place his chin on the top of the fence. Then, with a Herculean effort, he used his chin to pull himself up, while using his front and rear flippers to walk up the wall. None of this was typical sea lion behavior. After a 5-minute struggle, he pulled his 550-pound frame to the top of the fence, and plopped to the ground on the inside of his habitat. He proceeded to get comfortable in his favorite sleeping spot, exactly where we find him every morning! The next evening, I watched Jones again from my hiding spot. About an hour after closing, Jones woke up from his slumber, paced the entire exhibit as if looking to make sure nobody was watching (yes, anthropomorphic again). Then he carefully reversed the process, climbing out of the exhibit, just as I had watched him climb back in that morning. It was obviously difficult and required some balancing skill, strength, and determination, but he eventually made it over the fence and went straight for the lake where he foraged for fish all night long, returning back home at sunrise, just as he had done the night before. Was his impeccable timing of climbing in and out when he could not be observed related to his expanded problem-solving ability? I feel certain that Jones' 10-year training experience, regular exercise of his neck and flipper muscles, and his trained repertoire of climbing and standing, made his fishing expedition possible. Was his impeccable timing of climbing in and out when he could not be observed related to his expanded problem-solving ability? Could his desire to come back every morning be a sign that he clearly enjoyed interactions with his trainers? It didn’t seem as if he returned just to get a free breakfast; he showed little interest in eating from us when he returned! I believe this story demonstrates a variety of ways that training gives animals a wider repertoire of skills. These three stories just scratch the surface; I have worked with many animals that demonstrated unique and untrained problem-solving skills. There was a dolphin, Misty, who learned to collect trash and hide it away in a drain like a bank account so that she could cash it in for fish when she felt the need. Ranbir the gibbon, upon seeing a wild snake enter his habitat, figured out how to hide in a restraint box and lock himself in so that he was safely out of harm’s way. Service dog Lambo, faced with a fire and an unconscious owner, took the initiative to grab the sleeping baby by the onesie and carry it to the neighbor’s house. Lambo’s action resulted in getting the owner help in time, and ultimately saving the lives of all involved. We see examples in the service and guide dog world all the time of dogs that go far beyond what they were trained to do and accomplish the improbable. Training expands animals’ views of their world and enables them to accomplish tasks that had not been specifically trained. Positive reinforcement opens up learners’ thinking and allows them to explore and grow with greater confidence. Animals trained with punishment tend to have the opposite happen; their worldview shrinks and they are hesitant to try new things. Positive reinforcement training sets up animals to be eager learners and makes it possible for them to accomplish far more than we train purposefully. Positive reinforcement training sets up animals to be eager learners and makes it possible for them to accomplish far more than we train purposefully. In an upcoming article, I will explore this idea further, looking at the impact of training on resilience and learning potential when working with and training dogs with serious behavior challenges. The more I am exposed to the power and benefits of positive training, the more impressed I am by the possibilities and the remarkable ways that animals benefit.